Dr. Meyer is Assistant Professor of Medicine at the University of Pennsylvania’s Perelman School of Medicine. She received her undergraduate degree from Yale University, her medical degree from the University of Chicago, and a Master of Science degree in Translational Research from the University of Pennsylvania. She completed internal medicine residency, chief residency, and fellowship in Pulmonary and Critical Care Medicine at University of Chicago Hospitals. 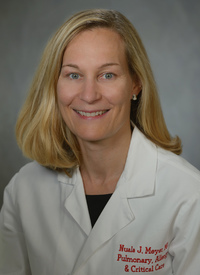 Dr. Meyer’s research focus is the genetic and molecular characterization of sepsis and acute respiratory distress syndrome (ARDS), with a goal of identifying molecular risk factors that may reveal novel therapies. Her current work leverages genetics to evaluate the causality of plasma markers towards ARDS and evaluates a potential precision medicine option for ARDS.